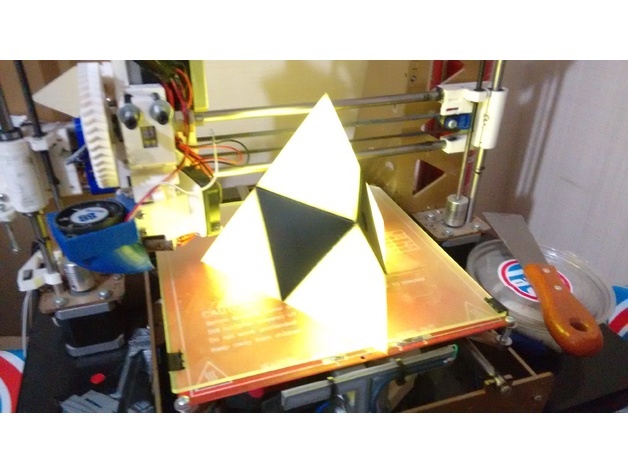 Triforce 3D Lamp #3DPrinting #3DThursday « Adafruit Industries – Makers, hackers, artists, designers and engineers! G0057Y shared this project on Thingiverse! This is a 3D Lamp model of the Triforce from Legend of Zelda saga games. Button cap with Hylian Shield Desgin with a 3mmx2mm hole to insert the square button pin. The hollow yellow pyramids must be glued in position, but it has a 3mm overgrowth so they fit right in. Brightness depends on the LED you use, but its not a reading lamp, just decorative.